Guided Ile de la Cite & Ile St. Louis Tours Include: Our Paris guided tours include services of your private Paris tour guide. Not Included: Entrance fees to sites you choose to visit. Let Well Arranged Travel take you on one of their private guided Paris walking tours. This guided Paris walking tour features Ile de la Cite and Ile St. Louis, two islands on the Seine, the romantic river that threads its way through Paris and beyond. 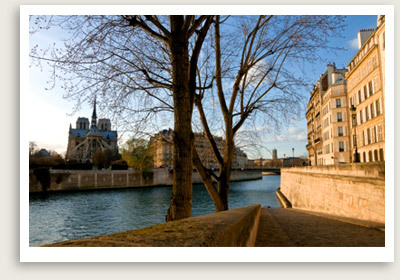 First you will visit Ile de la Cité, considered the cradle of Parisian civilization. Featured points include Pont Neuf, Vert Galant square, Place Dauphine, Conciergerie, the gardens of Hotel Dieu, Rue Chanoinesse and the house of Eloise and Abelard. You will have private guided tours of Paris two famous religious landmarks here: Notre Dame and Sainte Chapelle (time permitting). Next on your Paris private tour is a guided walking tour of Ile St. Louis, a tranquil getaway from the hustle and bustle of Paris. Here you will visit Quai d’Anjou, which houses the former residences of Daumier, Daubigny, and Cézanne, and Quai de Béthune, once home to Helena Rubinstein and Georges Pompidou. You will also see Hotel Lauzun, Quai Bourbon, Hotel Jassaud, and l’Ile St Louis church, and Hotel Lambert (Rothschild). Exclusive art galleries and gift shops line the main street of Ile St. Louis, offering one-of-a-kind shopping opportunities. This Paris private tour concludes with a stop at Berthillon, thought to be the best ice cream shop in Paris. NOTE: Security lines in St. Chapelle are usually very long. Advise us if this is a must in your itinerary.